As you know I'm no stranger to the crop top and high waisted full midi trend. I love the juxtaposition of the lady-like skirt coupled with the edginess of the crop top. I picked this crop top up in Boohoo for a total bargain of €5 (would you be well if you were sick!). Unfortunately the top might not now be warm enough to wear out and about at the moment but I have full intention of getting a lot of wear out of it in the forth-coming warmer months. Love this look! 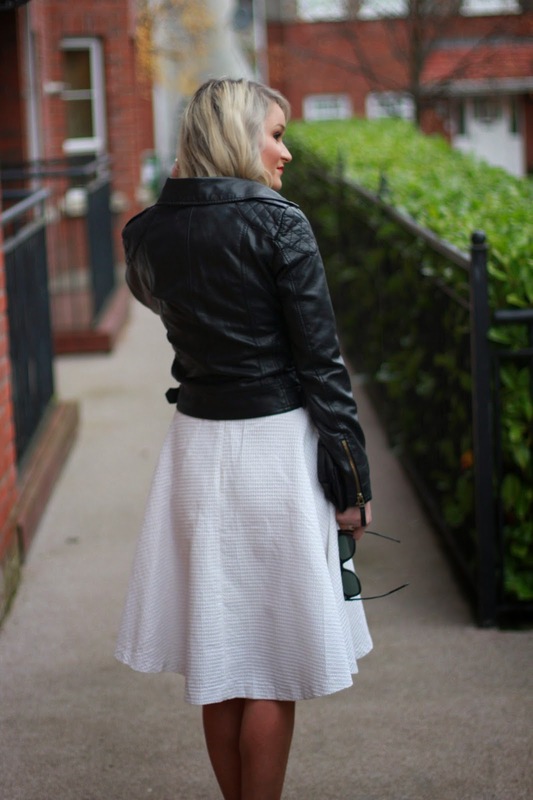 I love the ladylike silhouette of the white skirt paired with the cropped top and edgy leather moto jacket. So adorable! Love both of these looks. The crop top is super feminine but the leather jacket adds an edgier feel - both are perfect! Another amazing bargain, love how you gave the girly skirt edge with the leather jacket love it! The tops is a perfect match to that skirt, love this look!